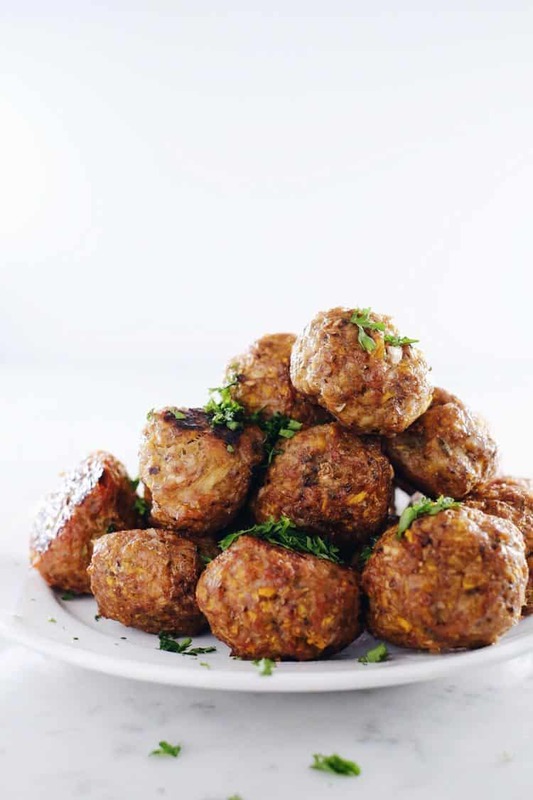 We get a lot of requests for egg-free breakfast recipes, so these butternut breakfast meatballs are for all you egg-free folks! Justin loves eggs for breakfast; they are his favorite food. Just ask, and he’ll tell you! That said, they are really a go-to in our house, so coming up with egg-free breakfast ideas requires us to think outside of the box a bit. 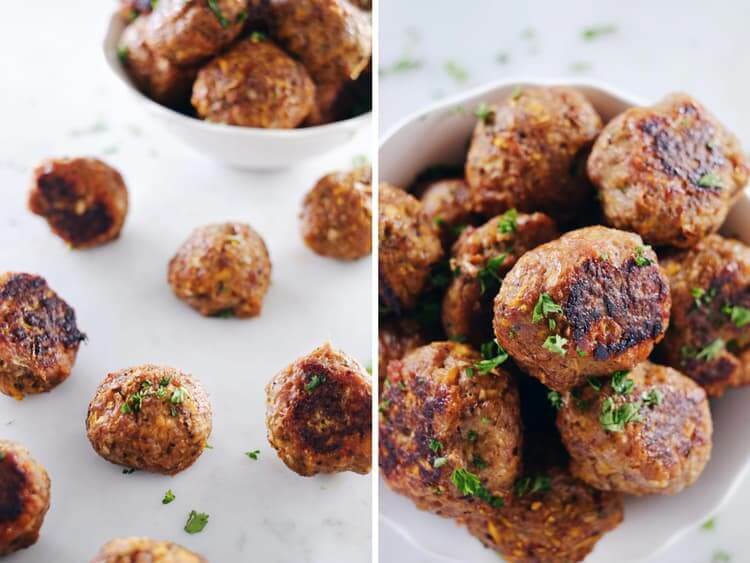 One of my favorite things about making these meatballs is that they are the perfect make ahead breakfast! When we make them, I love how easy breakfast is for the rest of the week! 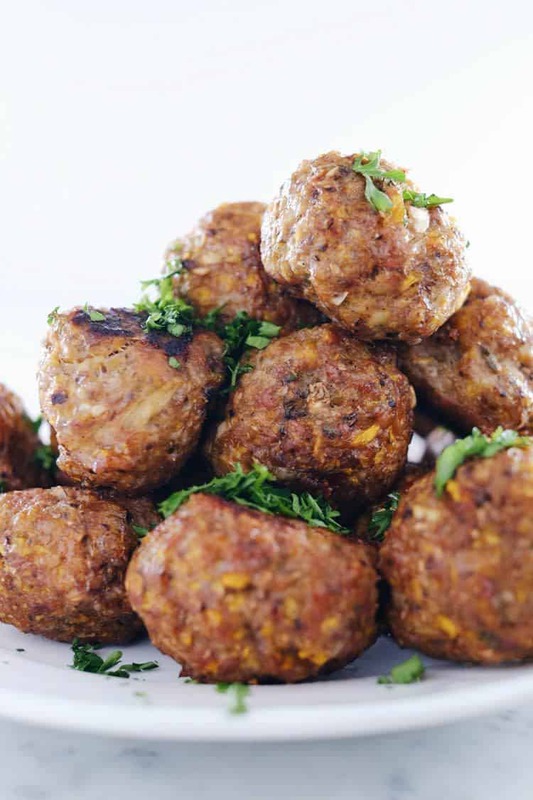 Just re-heat these butternut breakfast meatballs and enjoy the easy morning. They are also easily packed and enjoyed once you get to your office if that’s your thing, too. 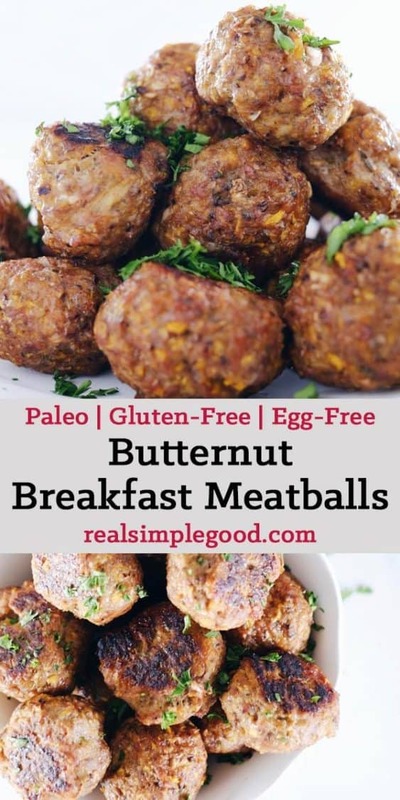 Since these butternut breakfast meatballs have squash in them in addition to the protein, they’ve got fiber built in which makes them filling and a great way to start your morning. I love eating them over a bed of greens and with some kraut to get the day started with some probiotics, too. Such a yummy and satisfying combo! 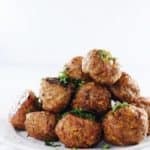 Go ahead and make these butternut breakfast meatballs over the weekend to enjoy for breakfast throughout the following week. It will surely make your mornings easy and delicious! Let us know how it goes by leaving a comment below. Also, take a photo and tag us on Instagram @realsimplegood, so we can check it out! Hi…these look so good. Where are you finding good ground sausage? What kind do you use? Hi Kathy! We get our pork from Justin’s mom who raises pigs, and we usually just get ground pork and make our own sausage with it. Occasionally we will find some already made at Whole Foods or Natural Grocers where we live. Try looking for the brand Mulay’s Sausage (www.mulayssausage.com). All of their sausages are made with antibiotic Free Pork that is Humanely Raised, and they are all Certified Gluten Free, with No Nitrates, No Nitrites, No Msg, No Sugar, No Soy, No Dairy. Can I make these with ground turkey sausage, and if so is there anything extra I’d need to add or change the cooking time? I just took these meatballs out of the oven; and they are so good. I did add an egg for binding as we aren’t sensitive to them. On the seasonings I used 1/2 teaspoon of both the paprika as well as the cinnamon rather than a teaspoon of each. Do you think soaked Chia seeds would work for binding? If you follow the recipe as written you don’t need an additional binder. The processed squash helps hold everything together. I’m not sure how adding in soaked chia seeds would work. Let us know how it goes if you try it. I’m not a big fan of mushrooms. Would substituting zucchini work alright? Hi, these sound great! Do you think you could use frozen butternut squash cubes instead of fresh? How many servings would 30 meatballs be? We usually have 3-4 meatballs at a time (with something else like greens), so I’d say 8-10 servings. Thanks. Makes sense. Follow-up question, since i plan on making these this weekend. I prefer to buy the pre-cut butternut squash in our produce section; they cut it right there. Roughly how many cups would a “half butternut squash” be? For a medium squash, it would roughly be about 4 cups. Let us know how the recipe turns out! Delicious! Couldn’t find compliant breakfast sausage at our Whole Foods, so used your recipe for country sausage patties to flavor some plain ground pork. That was enough flavoring and perfect for me. (Not a fan of smoked paprika, and cinnamon seemed out of place for this old country boy.) I usually dread making meatballs, but these came together and held their shape easily. They weren’t brown like yours after 45 minutes in the oven, so hit them with the broiler for a few minutes. Now they look great, and taste amazing. Thanks! Great to hear, so glad you liked the recipe!